Ankara, Turkey is just one more example of how UltraZyme® leads the way in waste and waste water remediation, as shown by this beautiful fountain installation in Türkiye. This waste water remediation was carried out by blending UltraZyme® into the foul pool water which combined with glaring sunlight was previously infecting the entire bottom with algae and dirty moss coated the sides of the pool. Also, as a result of this polluted water, there was a very repugnant odor that the citizens found highly objectionable. The officials of this public centerpiece in Etimesgut County Center in Ankara treated the water for a period of 7 days and the results immediately after that period were highly obvious and successful in all respects. 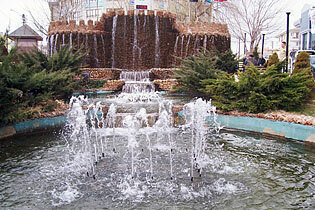 This is now a clean cascading fountain and pool that is once again odor free, clear and frequented by substantial numbers of the residents of Ankara who have benefited immensely by the obvious visual results along with other attributes of the UltraZyme® treatments on their now remediated popular meeting place. UltraZyme® was able to effectively provide algae treatment and water odour control.